Is David Bowie embarrassed today that he took part in this spectacular-hair adventure? He shouldn’t be, it is jolly good fun for the most part, and Bowie seems to know it. Even when he’s forced into performing a song mid-action, he takes it with the necessary humour. And what else would you do when you are cast alongside goblins and trolls, huge horned monsters and little foxes (apparently knighted) riding some fluffy dogs like a gentleman. 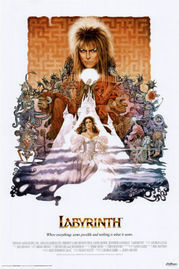 I am not even sure whether I like the film as a film, it seems a bit arbitrarily put together at times, the labyrinth tasks reminding me of some form of scheduled computer adventure game. Still it is very entertaining, and there is Jennifer Connelly to look at, and the topic of labyrinthine riddles is taken quite far, with some stunning visuals in particular towards the end, when an Escher-like stair system is the only thing between Sarah and her little brother whom she is tasked to get back. The fun is in the details, and many of the creatures Henson creates to help Sarah or keep her from making it through the labyrinth are cute, terrifying, or just outright weird (the two-headed doorkeepers spring to mind). Not on the same classic level as “Dark Crystal” is, lacking a bit of depth and story, but an inspired adventure all the same.